Cloudy skies are likely with isolated showers in several parts of Tamil Nadu. Partly cloudy skies are likely to keep the temperature at bay with some thundershowers possible at isolated locations in the evening and night. South interior Karnataka and the adjoining regions of Tamil Nadu could be in for a rather wet evening. An east west shear zone in the mid troposphere is likely to cook up some heavy rains in coastal Andhra Pradesh and one or two places in Chhattisgarh and Telangana. The places along the western coast are likely to continue accumulating rainfall with serene grace. An upper air circulation is likely to trigger scattered rains with some heavy falls in parts of Central India, especially in the state of Madhya Pradesh. Northeast India too, is likely to cash in with some heavy rainfall figures. 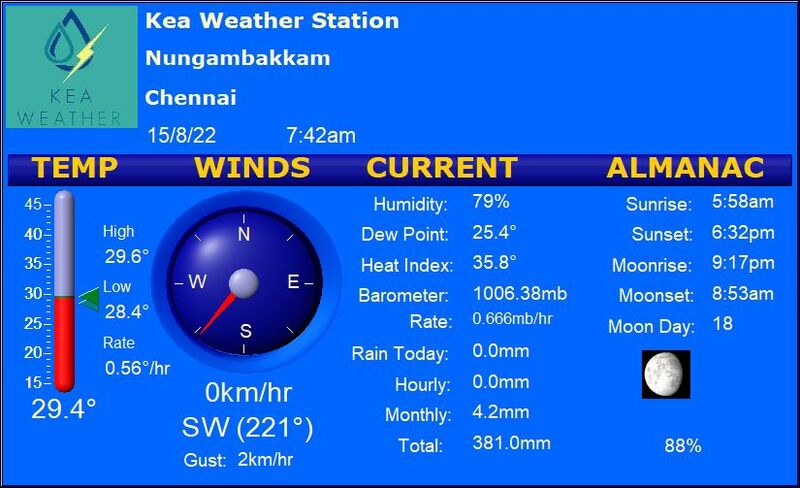 Chennai – A mild day on the cards with possible cloudy weather. Maximum temperatures of 33-34 C likely with possible showers in the night. Trichy – Rather warm day ahead with maximum temperatures of 35-36 C. Thundershowers possible in the district,later in the day. Madurai – The city is likely to witness moderate heat with a maximum temperature of 35-36 C, followed by thundery development in the afternoon. Vellore – A comfortable day ahead with a possible maximum temperature of 33-34 C. Showers could develop near the city by evening. Coimbatore – The city is in for yet another cool day at a maximum temperature of about 32 C. Drizzles could occur in some areas.